Netanyahu responds to reports that the police will submit recommendations in Cases 1000 and 2000. 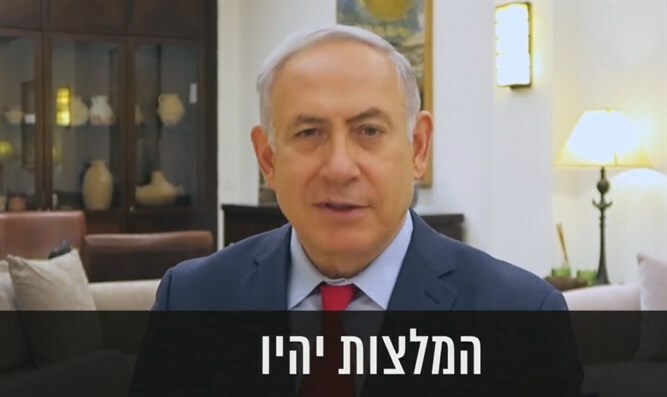 Prime Minister Binyamin Netanyahu on Wednesday evening posted a video to his Facebook page in which he addressed reports that next week, the police recommendations in Cases 1000 and 2000 will be submitted to the State Prosecutor's Office. Police are conducting two parallel investigations of the Prime Minister. The first, dubbed “Case 1000”, began in December 2016 and centers around claims the Prime Minister improperly received gifts from a number of wealthy businessmen. In “Case 2000” police are probing allegations that Netanyahu and Yediot Ahronot publisher Arnon “Nuni” Mozes conspired to soften the paper’s anti-Netanyahu line in exchange for passage of legislation barring the free distribution of Israel Hayom, a rival paper that has cut into Yediot’s readership in recent years. Netanyahu's video came following reports in the media that police will recommend that Netanyahu stand trial over bribery in Case 1000. It has not yet been decided whether they will recommend he be indicted in Case 2000. "Many of you are asking what will happen, so I want to reassure you: There will be nothing, because I know the truth," Netanyahu said. "The State of Israel is a state of law, and the law states that the person who determines whether there is evidence against the prime minister is the attorney general, and he consults with the state prosecutor. The state prosecutor himself said recently that about half of the police's recommendations end with nothing," continued Netanyahu. The prime minister added that he is certain that there will be no recommendations to indict him. "So do not be in suspense: There will be recommendations, there will also be signs such as 'Bibi is guilty until proven innocent', there will also be inappropriate pressure, but I am sure that at the end of the day the competent legal bodies will come to one conclusion, to the simple truth: There is nothing,” he concluded.